Aerial view of Unity House buildings and grounds, Forest Park, PA, circa 1948. In 1892, Jacob Ottenheimer, the immigration agent for the Canadian Pacific Railroad, bought 12,000 acres near Bushkill Falls in Pennsylvania’s Pocono Mountains and there built “Forest Park,” a lavish summer resort hotel for German-speaking Jews. Forest Park flourished until World War I, when anti-German hysteria and pressure from the federal government forced Arthur Lederer, Otenheimer’s son-in-law, to sell the resort. The new owners, however, were far from what the hotel’s opponents had hoped for, or expected. In 1919, Lederer sold Forest Park’s buildings, 750 acres, and a lake for $85,000 to Locals 22 and 25 of the Dress and Waistmakers' Union, a radical union of Jewish, New York City women garment workers. The next year, he sold the adjoining 2,196 acres and Lake Tamiment to the Rand School of Social Science, a New York City school for workers closely allied with the Socialist Party. Local 22 and 25 bought Forest Park as a permanent home for its new "Unity House,” a program of worker education and leisure activities that it first ran in a rented a house in the Catskills in the summer of 1919. Next door, the newly formed People's Educational Camp Society soon opened Camp Tamiment as a summer retreat for other New York City workers. The Locals bold experiment in running a worker resort near the summer homes of millionaires, however, soon floundered. So in 1924, they sold the property to the General Executive Board of the International Ladies' Garment Workers' Union (ILGWU), the largest women’s union in the United States, which undertook a series of major improvements that would transform Unity House into a "workers' play land." Less concerned about profits than with showing "labor in its proper light," the ILGWU renovated the main building, expanded the kitchen, built an amphitheatre, added new bungalows, and increased wages for its expanded staff, which included on-site doctor, chef, and dietician. To make attendance affordable to rank and file members, it charged minimal fees and, when necessary, financially subsidized the operation. Representing "a promise of a better day and our ability to bring that day," Unity House thrived during the 1920s. Here, union members and their families enjoyed a broad range of summer sports, dramatic performances, concerts, and lectures on current events, economics, art and literature, and social psychology presented by college professors, union leaders, and public figures. The mostly-New Yorker staff grew to several dozen people over time, including dining room servers, musicians, and a lifeguard. 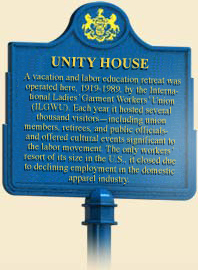 The ILGWU also rented the facility out to other unions, which made Unity House a getaway spot for the larger labor movement. Next door, Camp Tamiment, soon heralded as the "largest summer school and camp for workers in the world," built its own bungalow colony, called Sandyville, and opened the Tamiment Playhouse, which offered a growing variety of theater, dance, and musical programs, many of them presented by resident companies. The 1930s and 1940s brought many changes to Unity House and Camp Tamiment. During the Great Depression, thousands of women joined the ILGWU, and the American labor movement enjoyed a new vitality and unprecedented legitimacy. After a kitchen fire destroyed Unity House’s main building in the 1930s, architect William Lescaze—who also designed the modernist PSFS Building in Philadelphia-- designed a new building that included the infamous Diego Rivera murals that John D. Rockefeller had commissioned for the RCA Building in New York City, and then rejected. Rivera provided free duplicates to Unity House, which it proudly displayed--with the exception of two that lampooned Mussolini, for fear of antagonizing Italian members. The federal government's closure of New Jersey's Atlantic City resorts during World War II helped Unity House turn a profit between 1942 and 1949. Buoyed by the high blue-collar wages and strong union culture of the post-war economic boom, Unity House improved its facilities and added a rustic recreation center called the Philadelphia Building, designed by Louis Kahn. After World War II, Unity House became the union showcase that its founders had dreamed of. Noting the impressive facilities and programs for children writing, Eleanor Roosevelt wrote after a visit in 1945 that "You could not put children in a more favorable environment." In the summers that followed, some 10,000 visitors came each summer for vacations, retreats, forums, and conferences, all of which featured activities designed to booster union solidarity, including musical productions that featured union songs. In the post-war era, Unity House also expanded its mission beyond the entertainment and education of its membership. In 1948, ILGWU president David Dubinsky hosted an unprecedented weekend meeting for some 200 manufacturers, which helped avert a strike. Other "employer weekends" soon followed. Other unions also took advantage of the resort's impressive facilities for their meetings, including the National Association of Letter Carriers and the AFL-CIO. Given the ILGWU's clout and increasingly close ties to the Democratic Party, the resort also became a campaign stop, where politicians, as union official Ralph Reuter recalled, would "mix and mingle among the rank and file." Pennsylvania's Democratic governors George Leader, David Lawrence, Milton Shapp, and Robert Casey all visited, as did Senators Jacob Javits, Joseph Clark, Richard Schweiker, and Edward, John, and Robert Kennedy. Next door, Camp Tamiment also thrived. By the late 1930s, the Camp increasingly became a more mainstream resort for middle-class American Jews with progressive values, and the Tamiment Playhouse was emerging as an important training ground for Jewish American entertainers. In the summer of 1939, Danny Kaye and Imogene Coca starred in “The Straw Hat Review,” the only complete summer camp review ever to go to Broadway. 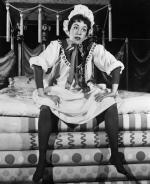 In the 1940s and 1950s Woody Allen, Jerome Robbins, Neil Simon, and other stars in the making performed Tamiment, whose theater company in the summer of 1958 wrote and produced Once Upon a Mattress, which then began a successful run on Broadway starring Carol Burnett, another Tamiment alumna. Camp Tamiment was so profitable that from 1937 to 1956 it provided a significant portion of the Rand School's funding. The good times, however, were not to last. In the 1950s, the ILGWU could afford the subsided the operation. In 1953, for example, 78 percent of the guests were ILGWU members who paid a discounted rate. By the 1960s, Unity House and Camp Tamiment, like neighboring resorts in Pike and Monroe Counties, were struggling, as air travel, cruises, and suburban country clubs offered vacationers many alternatives to the Poconos. In 1965, Camp Tamiment closed its doors; two years after the Internal Revenue Service had revoked its tax-exempt status. When the Unity House administration building with its Rivera murals burnt down in 1969, the ILGWU replaced the building and hoped that the proposed Tocks Island dam and creation of the Delaware Water Gap National Recreation Area would increase its appeal. In 1972, Unity House opened a new main building that began to host newcomers to the union, including Hispanics, Asian Americans, and African Americans, who joined the aging Italian and Jewish membership. The American garment industry, however, was experiencing serious decline as sewing jobs moved overseas and ILGWU membership fell from its 1968 peak of 451,000 to 360,000 in the mid-1970s. By the late 1980s only 160,000 members remained. Attempts to attract a younger crowd of members to Unity House, with the addition of "El Coco Loco" Lounge, did not help. In January 1990, faced with declining membership and annual subsidies of some $1,000,000, the union reluctantly closed the resort. In the middle decades of the twentieth century Unity House and Camp Tamiment provided recreation, instruction, and entertainment to thousands of ethnic, blue-collar, and middle-class Americans. Unity House had also effectively cultivated a "union culture" that ensured loyalty and strengthened the ILGWU during strikes and hard times. Lawrence Squeri, Better in the Poconos: The Story of Pennsylvania's Vacationland (University Park: The Pennsylvania State University Press), 2002. Kenneth Wolensky, "Unity House: A Worker's Shangri-la," Pennsylvania Heritage 20:3 (Summer 1998): 21-29. Kenneth C. Wolensky, "Workers' Education and the Transformation of Pennsylvania's Wyoming Valley District of the International Ladies Garment Workers' Union, 1944-1963," Canal History and Technology Proceedings, XIX (18 Mar 2000): 69-90.